It’s good to get lost. And while I love quick-and-easy dinner ideas, I also love to get lost in the kitchen. On a lazy Saturday afternoon, I like a real recipe. One that has a long list of ingredients and takes hours to cook. One that, when finished, is delightfully — and deeply — satisfying. 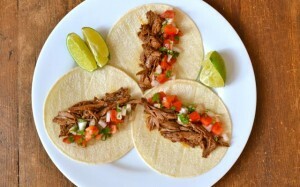 Like this recipe for Better-Than-Chipotle Barbacoa. For a thorough and interesting discussion of the recipe, check out this post by Kenji Lopez-Alt on Serious Eats. I followed the recipe fairly closely, with just a few modifications (mainly: reduced the cumin, cloves and oregano; added brown sugar; used slightly different dried chiles; and didn’t supplement with browned oxtails). I also cooked it in my Crock-Pot instead of the oven. And it was fabulous, y’all. We ate it for breakfast, lunch, and dinner. Think you might give it a try? This would be perfect for a fall weekend, together with good friends, cold beer and college football. Meanwhile, in a large saucepan, heat 1 tablespoon olive oil until shimmery but not smoking. Add the chuck roast and sear on all sides until brown, about 5 minutes total. Remove roast and place in crock-pot. Using the same saucepan, heat remaining 2 tablespoons olive oil over medium heat. Add onions; cook, tossing occasionally, until soft and brown, about 10 minutes. Add garlic; cook, tossing occasionally, until fragrant, about 2 minutes. Add cumin, cloves and oregano; cook, stirring constantly, until fragrant, about 30 seconds. Add chipotle chiles, vinegar, brown sugar, and remaining chicken broth; simmer, stirring occasionally, about 5 minutes. Transfer everything to the bowl of a food processor. Under running water, remove the stems from and clean the seeds out of the softened chiles. Place cleaned chiles and cooking liquid in the bowl of the food processor with the other ingredients. Add fish sauce and salt. Process until completely smooth, about 3 minutes. Taste; add additional salt as needed. Pour the blended mixture over the roast in the Crock-Pot. Add 2 bay leaves. Cook, covered, over low heat for 6 hours. Set lid ajar and cook for 2 more hours. Remove roast from Crock-Pot and let cool. Shred beef using your fingers or two forks. 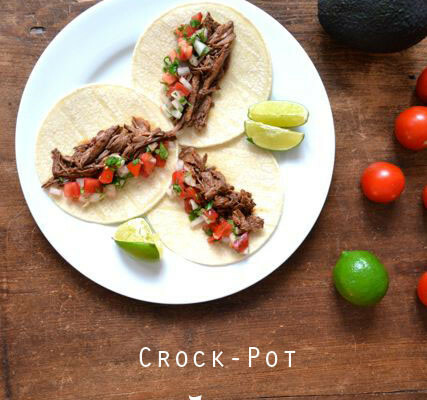 Return shredded beef to Crock-Pot with sauce and stir until beef is coated in sauce. Season to taste with salt. Serve warm with tortillas and toppings (salsa, guacamole, crumbled queso fresco, and lime wedges). Marie: I made this yesterday for a bunch of friends. Omygosh soooo good! Everyone loved it. I maodified a bit by adding about 1/2 cup tomato purée to the sauce to turn down the heat for the kiddos. And then I set aside a portion of the meat and didn’t return it to the sauce for the kids’ portion. So so yummy! Thanks!